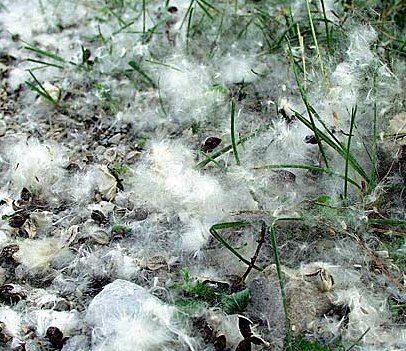 The air in parts of town has been full of fluff, white fuzzies drifting in the breezes like impossible June snowflakes. 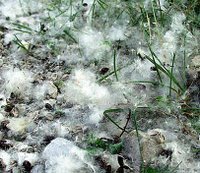 It’s the season for the cottonwood to cast its future to the wind and, like the lowly dandelion, to set countless cotton-covered seeds adrift to find new home sites, often covering the ground with white. The Eastern Cottonwood is a wetland-loving poplar, a group of trees with more than usual ties to the wind. The leaves and their stems are shaped in a way that makes them move in even the slightest breeze. They shake – or quake, as in the Quaking Aspen, another poplar. No one is quite sure why they wiggle, but the creative minds of the past devised reasons. Legend has it, for instance, that Christ’s cross was hewn from a poplar and that ever after, the tree has trembled with fear at the awful deed to which it was a party. Perhaps that explains why today, its lumber is considered so poor that it is used mostly for packing crates and pallets.